Hi everyone, it has been a while. I hope you are all well and enjoying the summer. Tony and I had a fantastic holiday, the weather was just perfect. Loads of awesome food, lots of walking and some wonderful places visited. It was rather a shock to come back to the stock take. But that was completed with Bev's high level of efficiency and went off without a hitch. It has been a couple of busy weeks since we arrived back. We have had another attempt at re-arranging our warehouse. Moving shelves and units is not the easest thing to do when they are filled to the top with new ribbon. Far too heavy to move loaded, so you remove the ribbon.....ummmmm where do you put it.....move the shelves and then re-stock with the ribbons. All sounds so simple when I dream up the idea, but in practice something rather different, oh well it all looks good now. Our loading bay is now larger, to allow for the exhibition stand to be returned from shows and laid out, rather then trying to re-stock around the warehouse. All the exhibition stock is in the same area, no more hunting required! It looks really good, we have even started planning the new stand layout for the Exeter show which is towards the end of September and we are still in August!!!! I have not been able to do much crafting, although my fingers have been busy. I have been after a new design software program for ages, but I have been rather unsure whether I would be able to use it. Not much computer confidence in me, all self taught by trial and error. Anyway I took the plunge last week....................I think my head was going to explode, I could not work the damn thing. Zillions of tutorial videos later, I cracked it......yeah...........I am so pleased. Pleased because it will mean improvements at CR but also pleased with myself.....I did it. Back to Hello Wednesday - I made this brooch for my holiday. I had a new top and I wanted something to match it. It hit the spot, looked fab on. 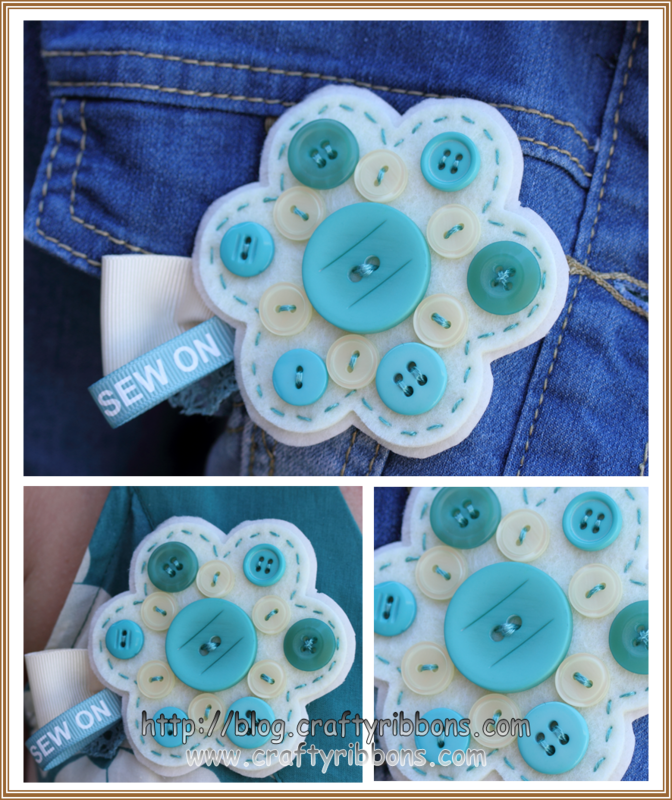 I used a selection of buttons from Cream and our exclusive Nile colourway Basics 2 Go button range. I also added one of the Keep Calm ribbons, but just the Sew On bit- a little different I thought. So many new things planned, lots of deliveries expected....oooh so exciting. All the family are away on holiday, I am in charge of 4 rabbits, 2 cats, a huge fish tank full of fish with lots of babies. and two houses. Wish me luck, I have had to set alarms on my phone to remind me to feed the animals!!! Not my forte.